Wow! Her room is gorgous. I love how simple it is, but so full of beautiful little touches. The colors are great. Yep! Love it! You have fabulous taste. I love the pallet wall and all the mint! It's perfect! What a gorgeous room! I love the pallet wall. love this! great job momma! This is absolutely beautiful! Love that wood pallet wall! Absolutely gorgeous! I love the colors you picked and the pallet wall especially!! It's perfect! We're buying the same Ikea dresser for our boys to share in their room — where did you get your knobs? Love it! I want to do a pallet wall some where in our house I just don't know where yet lol! Love. Love. Love. It's absolutely the perfect nursery. LOVE LOVE LOVE! 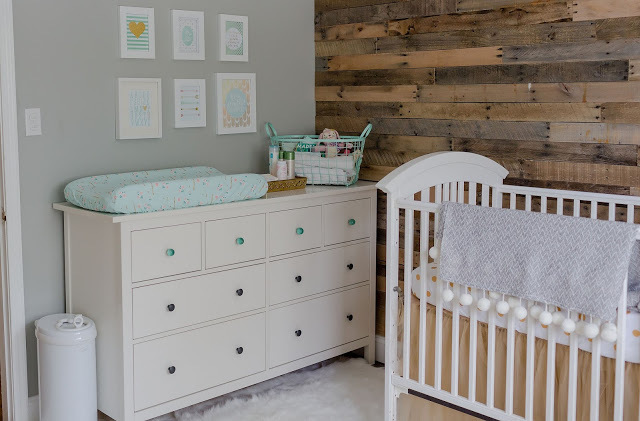 I want to do a pallet wall in Charlotte's room so bad, but where we are right now doesn't allow it! 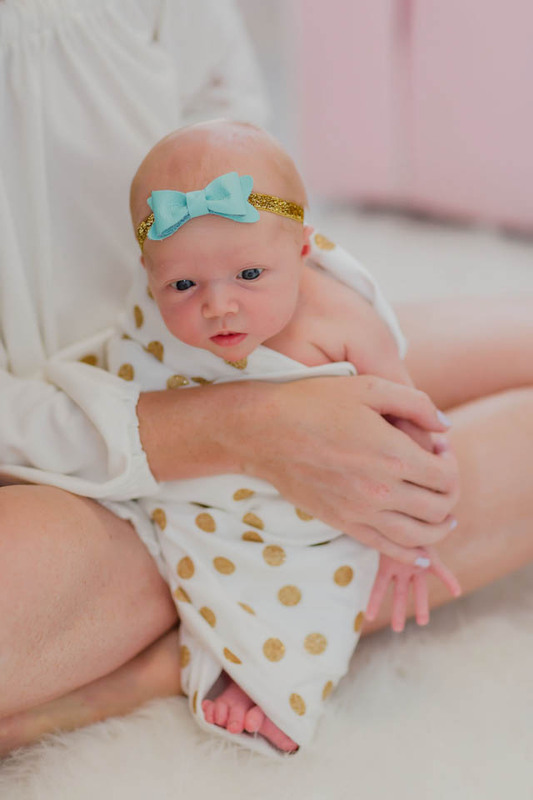 I like to call her nursery now her "version 1.0" haha! 🙂 You did such a stunning job! Just beautiful! Can you tell me where your crib is from? such a beautiful space! Our white rug needs a good cleaning and I'm not sure how/if i can do it? Love her bedskirt also!! Can I hire you guys to come to WI & do a pallet wall in our new house?? 🙂 I love everything about her sweet little space! It's just perfect! Such a gorgeous space. The pallet wall is amazing, Im itching to do one myself. Did you find it to be an easy DIY? Love everything about this room! So pretty! It's so beautiful! I love the wall! I love absolutely everything about her room. It looks beautiful! You did an amazing job, though, I'm not really surprised by that 🙂 I can see some of the little details from these pictures … so pretty. So beautiful, just perfect!! 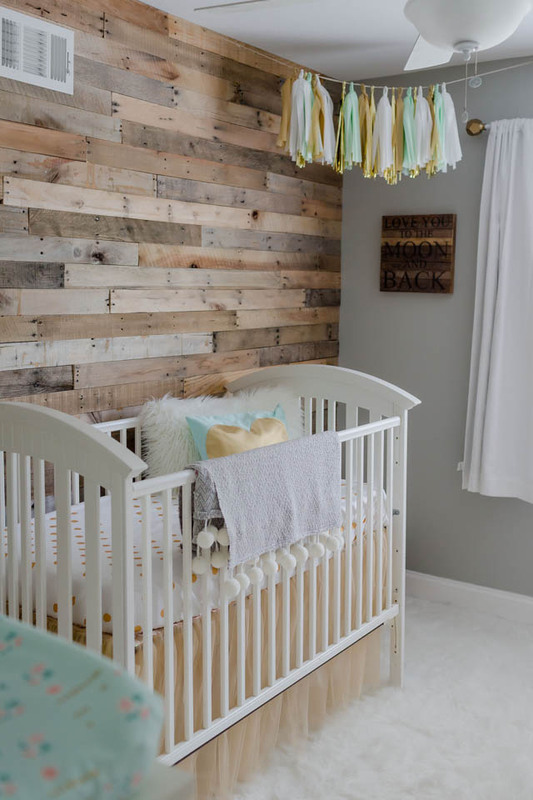 Seriously, I'll take one of those pallet walls in every room of my house. Her room is GORGEOUS!!! Seriously. Gorgeous. I LOVE LOVE LOVE the pallet wall!!!! So, so much! Her room is beautiful! That wall is amazing! Mister will kill me if I even think about it. Beautiful! That wall turned out amazing. Its the perfect mix of rustic girly 🙂 And that last pic is too adorable. It is stunning! And the pallet wall is just gorgeous. Definitely love the rug. It looks like the perfect spot for a nap. This might be the prettiest nursery I have ever seen!! You did a fantastic job!